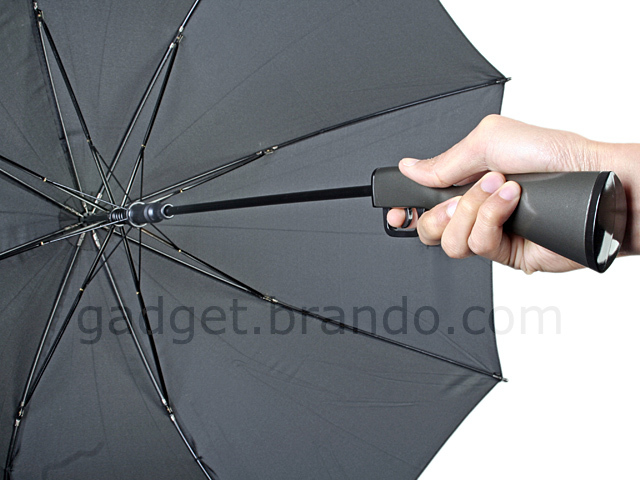 Welcome to Craziest Gadgets Solutions where we solve everyday problems with gadgets. 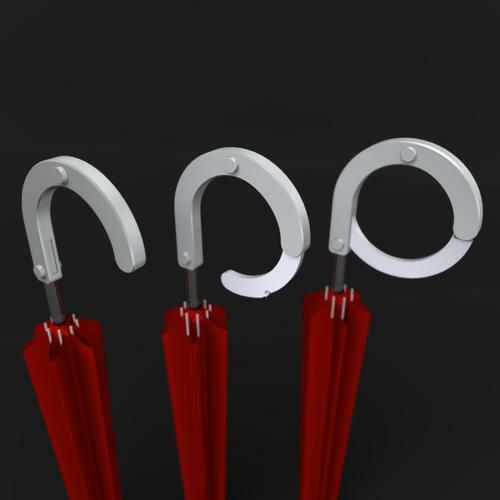 Umbrellas are great- they keep you dry and fold up into neat little packages. But there’s a problem with umbrellas- you have to hold them but you want to use your hands for other more exciting stuff. 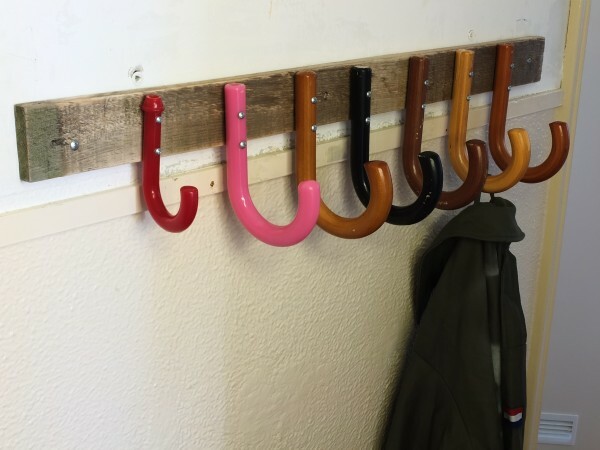 We’ve found 7 different solutions for you to keep those hands free while staying dry under umbrellas. Here’s how you can do it. 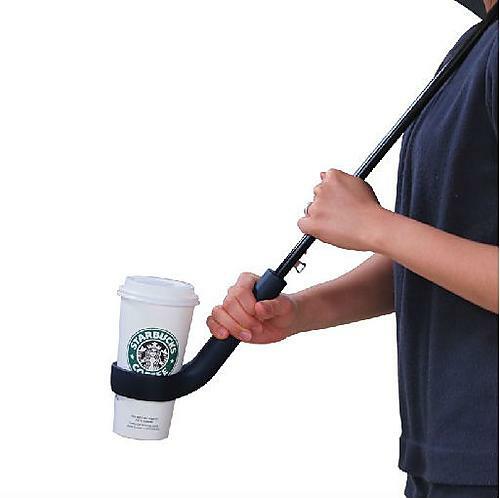 An over the shoulder umbrella holder. 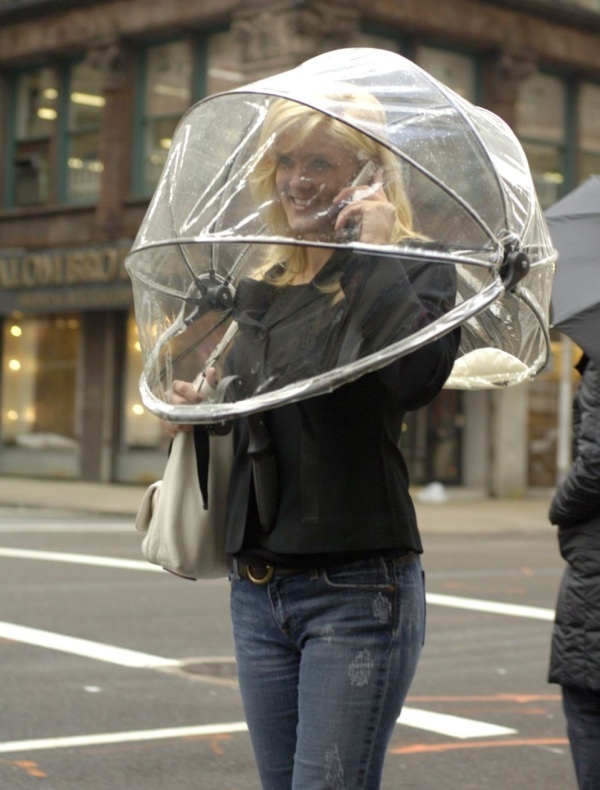 The Hands Free Shoulder Umbrella goes on your left shoulder and is good for sporting events; it looks like it might be a bit awkward to walk a lot with though. Plus does her coat look soaking wet in this picture or is it just me? Uhhhmmmmm…. 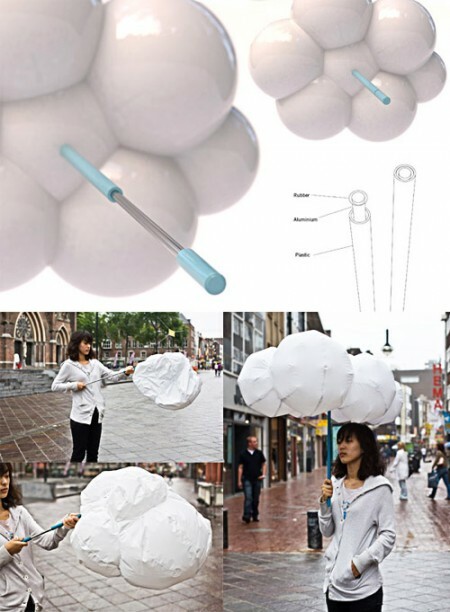 The The Backpack Umbrella. from Hammacher straps onto your back and clips around your waist and has a sturdy support rod to hold it steady while you walk the dog, carry babies, or whatever else you need to use your hands for- like the 200 lbs of groceries this lady appears to be carrying. 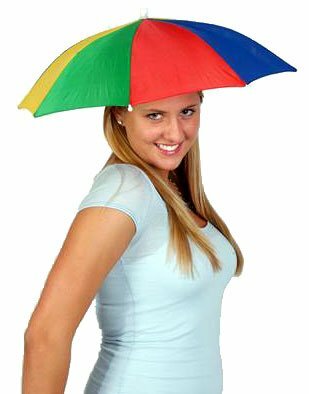 The Umbrella Hat might be considered a bit of a novelty in the ‘brella world but it will keep your head dry and your hands free even if you look a little silly. Ok a lot silly. 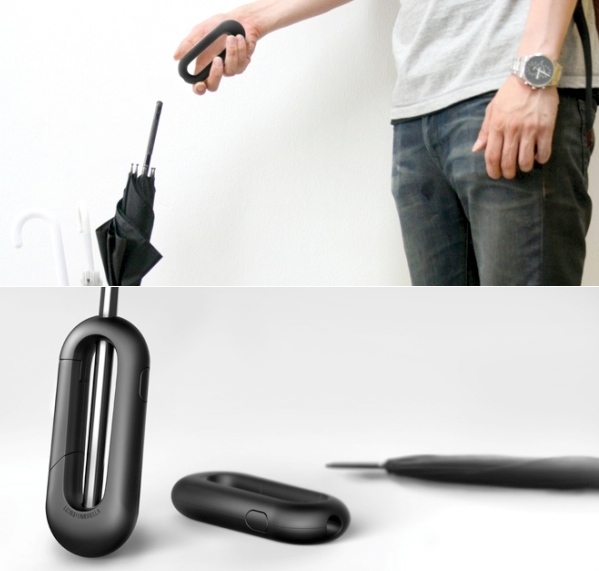 The Nubrella Hands Free Umbrella is like your own personal bubble of dryness. Or as we called it back in ’08 a fishbowl-like bubble of astronaut wannabe douchiness. 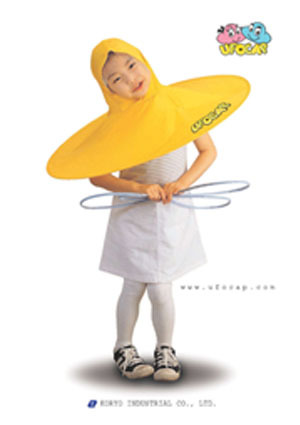 On the plus side, you can ride your bicycle with this on. 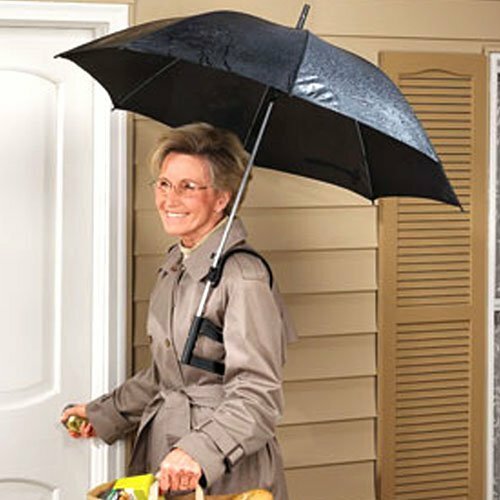 This next umbrella solution works if you have a stroller, walker, wheelchair, bicycle, shopping cart or other clampable object with you. 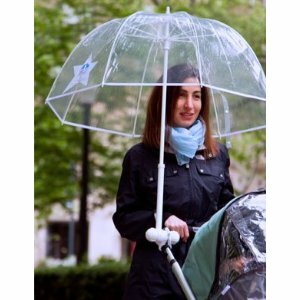 My Blue Bumbershoot Stroller Chauffeur Umbrella clips on to most things keeping your hands free to push. 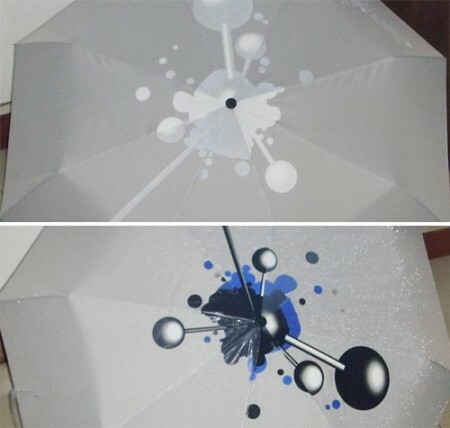 If you don’t have one of those things, we’re gonna go on a limb here and not recommend that you buy one just to use this umbrella. But hey, do what you want, it’s a free country. 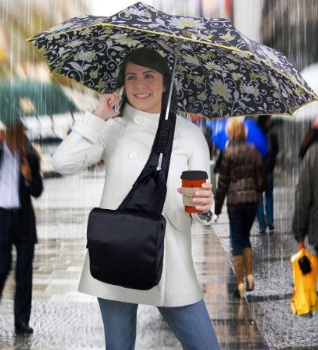 The Umbrella Messenger Bag is a double hands-free doohickey; it frees your hands up from holding both the umbrella and whatever you put in the bag. 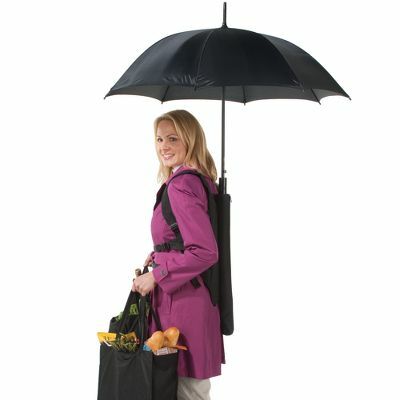 As a bonus, you can hold the umbrella in the bag when not in use. It has four compartments plus a cell phone holder. Our final solution is the most expensive of all- the manservant. 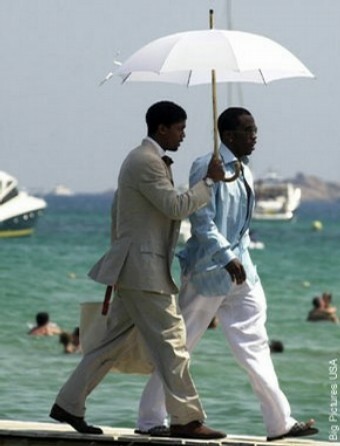 Once you get money like P-Diddy, you can hire your very own Fonzworth Bentley type person to carry your umbrella and open doors for you. That’s living my friends. That’s the solution to your problem.